Kartemquin will for the first time announce recipients of $150,000 in grants for up to 15 films at the 2018 Kartemquin Films Empowering Truth Benefit Luncheon, taking place on November 1st at 11:30am at the Union League Club of Chicago. Grants of up to $20,000 will be announced for eligible projects by debut or emerging filmmakers who are already receiving support through Kartemquin’s revered production process, which has guided over 65 award-winning, socially impactful films since the collective was founded in 1966. Kartemquin is the production home of America to Me and Minding the Gap - respectively, 2018’s best reviewed original TV series and documentary feature film - and 2018 double Academy Award® and Emmy® Nominees Abacus: Small Enough to Jail and Edith+Eddie, along with many more acclaimed films over its history, such as Hoop Dreams, Life Itself and The Trials of Muhammad Ali. The organization is also granting funds for the first time to filmmakers enrolled in its Diverse Voices in Docs (DVID) program, a nine-month professional mentorship and development program for documentary filmmakers of color organized by Kartemquin Films and the Community Film Workshop of Chicago that launched in 2013. Kartemquin will award up to three 2018 DVID fellows funding ranging from $5,000-$10,000 for a total of $20,000, and will increase that funding to a total of $50,000 for up to six DVID filmmakers in 2019. 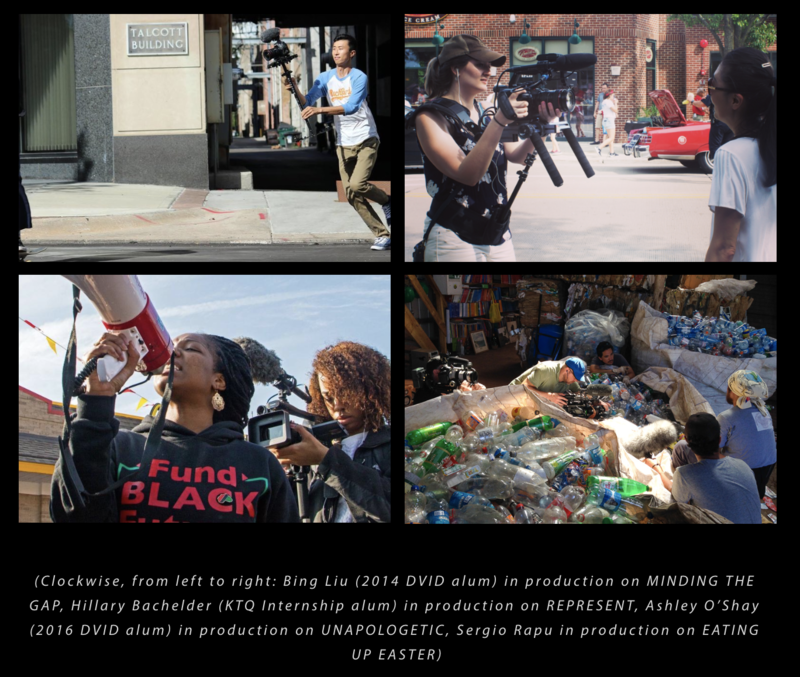 Kartemquin’s filmmaker development programs serve over 40 filmmakers annually and have launched over 500 alumni into careers in documentary filmmaking. The organization is a committed advocate for the sustainability of the documentary field. Tickets to the Empowering Truth Benefit Luncheon are available now at www.ktqbenefit.com. The event will bring together 275 filmmakers, partners and champions of impact storytelling to celebrate America to Me, the 10-part docu-series directed by Academy Award®-nominated filmmaker Steve James, produced by Kartemquin Films and Participant Media, and now airing on STARZ. The focal point will be a dynamic conversation about education, featuring the filmmakers and special guest participants featured in the series. The event will also showcase the achievements of and upcoming projects by Kartemquin’s filmmaking community. “Our Empowering Truth event on November 1st will be the culmination of one of the most successful years in our history, celebrating double Oscar and Emmy nominations, new films gaining unprecedented acclaim, and previews of others that will be soon to world premiere, ” said Betsy Steinberg, Executive Director. “These film-specific grants are part of both a next step in our evolution, but also a continuation of our philosophy, which has always been built on mentorship of young filmmakers, and building an inclusive, supportive community,” said Gordon Quinn, founder and Artistic Director. "Kartemquin has been a leading voice in the documentary world for 52 years, and these grants will help empower a new generation of storytellers to create social impact and advance democracy through truth. We are proud and excited to celebrate with the community on November 1st,” said Jason Stephens, Kartemquin Board Chair. Support for Kartemquin’s new film granting initiative comes from the Sage Foundation, the John D. and Catherine T. MacArthur Foundation, Voqal Fund, Chicago Community Trust and the Forum Fund. 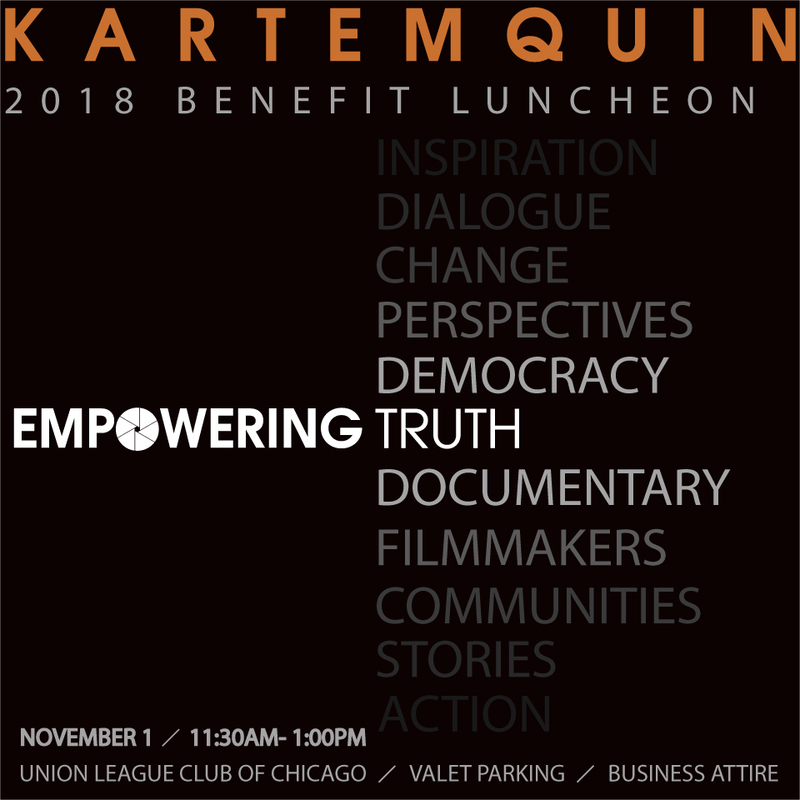 The 2018 Kartemquin Films Empowering Truth Benefit Luncheon takes place on November 1, 2018 at 11:30AM-1PM at the Union League Club of Chicago. Valet parking provided. Business attire required. The event will bring together 275 filmmakers, partners and champions of impact storytelling to celebrate Kartemquin’s new grantmaking initiatives and upcoming work from its co-productions and filmmaker development programs. The focal point will be a dynamic conversation about education, featuring the filmmakers and special guest participants featured in the series America to Me, the 10-part docu-series directed by Academy Award®-nominated filmmaker Steve James. Tickets are available at www.ktqbenefit.com. Sponsorship packages are also still available. Steve James’ America to Me, an epic, ten-part documentary series that The New York Times has deemed “a searing lesson in school inequity,” explores America’s charged state of race and education through a year with students, families, faculty and administrators at one of the country’s most diverse high schools. The series is produced by Kartemquin Films and Participant Media, airing on STARZ every Sunday night at 9pm ET / 8pm CT. In congruence with the series’ nationwide release on STARZ, Participant Media has launched a nationwide impact campaign already sparking thousands of conversations with educators, students, parents, and community leaders across the country. Learn more about the series here.